Older PostDaily Glass of Pomegranate Juice Show to Increase Testosterone by 30%! “If food is the #1 cause of distension, then why didn’t we see distension on the BB’rs of the 80’s and early 90’s?” In trying to connect the dots, these individuals assume that because BB’rs of past generations were not using insulin (for the most part) or large amounts of GH (due to it being cost-prohibitive), that drugs must be the cause. After all, aside from the emerging peptide market, today’s BB’rs are pretty much using the same drugs as their old-school brethren. While the doses may have grown over the years, for the most part, the only significant difference between the PED regimens of today’s BB’rs and those of generations past is GH and Insulin. On the surface this explanation seems to make sense…and there is a good deal of truth to it, as many BB’rs have indeed suffered distension from these drugs, but the point here is not that GH & insulin are innocent. Rather, the truth is that in many cases, they have been given a far larger share of the blame than what they have been responsible for. So, why didn’t the BB’rs of the 80’s and early 90’s have to deal with the distension that is so commonplace today? There is not a single reason, but if the most prominent factor were to be summed up in a single word, it would be “size”. The size difference between the typical 80’s BB’r and the mass monster of today is quite significant. Back in the 80’s, a 220 pound BB’r was considered big, with Lee Haney (who was in the 240’s for most of his Olympia career at 6’0), being considered a monster. Quite frankly, it just does not take nearly as much food to build or maintain the muscle mass found on a 185-220 pound BB’r compared to a 250-300 lb beast. As explained extensively in the previous article, the digestive system is not meant to handle the volume of food which modern BB’ing demands. In order to illustrate my point, let’s take a look at a holiday tradition which most American’s gladly participate in…Thanksgiving. Anyone who has helped themselves to several generous portions of their favorite foods on this day knows all too well what it means to experience stomach distension. For more than one person, this gluttonous feeding frenzy has resulted in a loosening the belt buckle or an unsnapping of a button or two. Looking in the mirror post-binge reveals the clear results of this eating ritual in the form of a bulging belly. For the average pro BB’r, thanksgiving does not come only once per year, but is a regular practice which must be engaged in on a daily basis. In fact, if the average person were to count the number of calories they consumed on Thanksgiving Day, they would fall short of the amount of calories consumed by the typical 250-300 lb BB’r on a daily basis. Eating 5-7X meals per day at 700-1,000 calories a piece is sure to result in considerable abdominal distension for anyone, aside from the most fortunate. The volume of food consumed by today’s BB’rs is not the only food-related cause of distension. The “type” of food consumed also plays a significant role. While the BB’ing diet if often viewed as a healthy pursuit, due to most individuals following a “clean” diet, the truth is that for many BB’rs, their diet is anything but healthy when it comes to the digestive system. Somehow, a misconception has arisen in which an abundance of meat and processed complex carbs is considered healthy. In looking at the average BBr’s diet, the majority of foods are derived from animal proteins and processed (or low fiber) carbohydrates. The typical white rice and chicken meal is one example. The BB’r may throw a few vegetables in there and usually, little to no fruit. Whole-grains are a rarity and sadly, many BB’rs don’t even understand the difference between a whole grain and a pile of white rice. The bottom line is that the average BB’ing diet is a nightmare for the digestive system. The lack of vegetables, fruit, and whole-grains (many BB’ing diets include zero whole grains, aside from the occasional low-fiber potato) combined with a massive amount of various meats and processed carbs prevents the digestive system from being able to digest, assimilate, and eliminate its food optimally. With the average pro already consuming an amount of food which his digestive system was not designed to accommodate, it makes sense to take steps which ensure that the process of digestion & elimination proceeds as efficiently as possible. However, many BB’ing diets are designed to do just the opposite, resulting in an increase in waste build-up within the digestive tract and subsequent distension. The 3rd food related factor involved in stomach distension is directly connected to uneliminated digestive matter. I am not referring to constipation, in which waste which is naturally (albeit slowly) making its way through the digestive system, but to food matter which has permanently/semi-permanently attached itself to the walls of the digestive tract. This is a common occurrence, especially when following the traditional American diet, and is primarily due to the types of food consumed. As revealed by autopsy, there have been cases where more than 40+ lbs of digestive waste was found lodged inside the digestive tract of deceased individuals. Aside from the obvious negative health implications associated with such poor clearance of digestive waste, it can and does directly affect the waistline. Even as little as 5-10 pounds, which is very common, can cause the stomach to protrude. In terms of food type, the principal offenders are animal proteins and refined carbohydrates. Foods such as whole-grains, fruits, and vegetables contain large amounts of both soluble and insoluble fiber, which is critical for keeping the walls of the intestines and colon free of debris. Dietary fiber is especially important for BB’rs, due to the sheer volume of food consumed. Unfortunately, most BB’ing diets are severely deficient in dietary fiber, further compounding the problem. It also bears mentioning that many BB’rs suffer from gluten intolerance, which affects around 15% of the U.S population. Left un-treated, it can cause digestive upset resulting in bloating, gas, stomach pain, constipation, and diarrhea. This condition is only occasionally diagnosed, and with the majority of BB’rs frequently ingesting gluten-rich foods in large quantities, this malady is without doubt contributing to the distension seen in a significant percentage of BB’rs. As shown above, there are multiple food related factors which can adversely affect a BB’rs midsection, such as food volume, food type, and personal response to one’s diet. This brings me back to the original question posed earlier, which was…“Why didn’t the BB’rs of the 80’s and early 90’s have to deal with the distension that is so common today? Frankly, the BB’rs back then were much lighter, with the average pro weighing about 185-225 lbs, and as such, they didn’t require the same amount of food to sustain their mass. Only a few men pushed the envelope to around 240ish’ and as mentioned earlier, only one man throughout the 80’s-early 90’s hit 250 pounds…Lee Haney. These days, on average, pro BB’rs eat so much more than their forefathers. It was common to see a pro BB’r from the 80’s eating 3,000 something calories (or less) per day in the off-season, with many pros pushing their calories all the way down to 2000 calories (or less!) during contest prep. Obviously, when eating that amount of calories, distension is going to be much less prevalent in the off-season and even more so pre-contest. If anyone has any doubt regarding the connection between food intake and stomach distension, try following a similar diet and see for yourself. For 7 days, eat 5,000 “clean” calories daily and then take a look at your stomach at the end of the week. This should put any doubts to rest. The next cause of stomach distension on the list is stretching of the abdominal wall, particularly the transverse abdominis. The transverse abdominis is a flat, sheath like muscle which runs underneath the superficial muscles of the abdomen, providing thoracic and pelvic stability. In addition, it helps maintain the midsection’s natural form by holding the other muscles of the abdomen in place, preventing them from spilling outward. If this muscle becomes weakened or stretched (as can easily happen through a combination of force-feeding and training), its ability to hold the midsection in place is compromised, allowing the stomach to protrude, or hang outward. 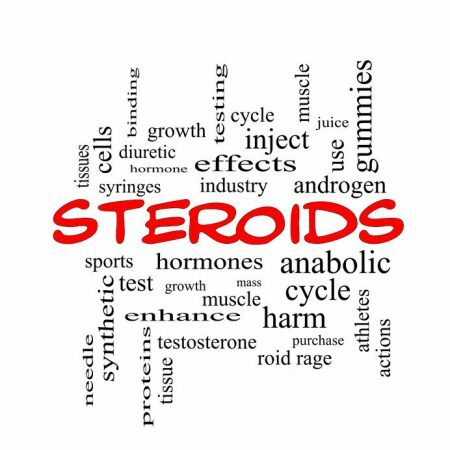 Unfortunately, several of the practices involved in modern BB’ing negatively affect the integrity of this muscle, with few BB’rs taking any type of corrective action. Repeated force-feeding (or any dietary habit which results in a distended abdomen post-feeding) will apply internal pressure to the transverse abdominis, stretching this muscle outward. Overtime, this chronic stretching causes the muscle to lose its elasticity, conforming near-permanently to the stretched position. The transverse abdominis is also adversely affected by certain forms of training, particularly exercises which involve a lot of core stabilization. Powerlifters are often taught to intentionally push the midsection outward during a lift by holding air in the stomach. This increases whole-body stability, which transfers over to maximal strength. Generally, this technique is avoided by BB’rs, due to its propensity to expand the midsection. However, while one may not intentionally engage in this practice, it complete avoidance is near impossible. In fact, the body will naturally attempt to stabilize itself to some degree in nearly every lift we perform. Obviously, lifts which utilize heavy weights and require greater torso stabilization, such as squats, deadlifts, overhead presses, and bench presses (compound lifts in general), will necessitate greater activation of the abdominal muscles. Today’s BB’rs are more likely to encounter this issue than the BB’rs of days past, due to the significant differences in training styles seen between the pros of the 80’s and today. 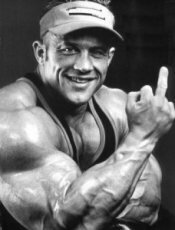 Starting with Dorian Yates, modern BB’ing witnessed the establishment of a new trend, in which the focus moved away from the high volume, pump oriented style of training, to one more focused on progressive resistance, in which volume was decreased and a new focus was placed on lifting as heavy and intensely as possible. At the same time, BB’rs began moving away from the over-use of isolation exercises and began favoring the traditional mass-builders, in an attempt to get as big as possible. This included the re-immergence of certain exercises which were largely absent from the training routines of the 80’s, such as deadlifts. While aesthetically detrimental, this approach was effective, with BB’rs moving heavier weights than ever before on the compound exercises and as a result, they showcased a level of muscular development which was unheard of in the 80’s. In addition, this new training style is also likely to lead to increased hypertrophy of the abdominal muscles, further contributing to the size of the midsection. Acting as natural stabilizers, the muscles of the abdomen lend support to the upper-body while training, particularly when performing the basic exercises. As the load on the target muscles is increased through progressive resistance, the muscles of the abdomen grow in order to accommodate the increased load. While this may contribute to the overall size of the midsection, it plays only a minor part and is mentioned more as an afterthought than a significant factor.